Join us for our Friday night Summer Music Series, a seasonal tradition of music, food, and wine. 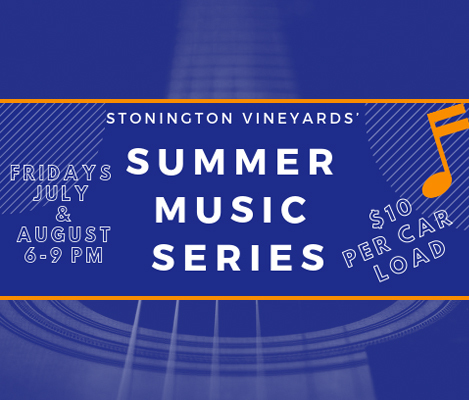 Every Friday evening from 6 – 9PM in July & August, Stonington Vineyards welcomes the area’s best acts for a relaxing evening of music on our patio. Guests are invited to bring lawn chairs, blankets, and light bites to enjoy on our spacious lawn. Brick n’ Basil Pizza Truck & Spicey Fusion Food Truck will be on site serving up delectable bites, and picnic dinners are welcome. It’s the perfect summer evening! Please see below for our rain policy. 25% of all parking fees will go to relative charity. Family friendly, and dogs welcome. Please note: OUTSIDE ALCHOL (besides Stonington Vineyards’ wine) IS NOT PERMITTED ON PROPERTY. Wine is available for purchase and enjoyment by the glass or bottle only during concerts, and wine tastings are unavailable on Friday evenings. As parking is limited during concerts, we kindly ask guests to carpool. THE CONCERT SERIES IS NOT RAIN OR SHINE, but weather dependent. Please contact Stonington Vineyards directly, or view social media for rain dates. We will remain open until 9 regardless on Friday evenings for July & August only. Due to the crowd size, plastic wine glasses are used on Friday evenings, so we encourage guests to bring their own wine glasses. 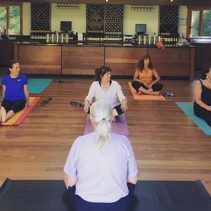 Sunday, May 12th This Mother’s Day, celebrate mom in style at Stonington Vineyards! Spicey Fusion Food Truck. Live music by Dan Watson, 2-5pm.